When I came back to Vancouver after 6 months, the first restaurant I wanted to go to was Pinpin but it is pretty inconvenient for people to come all the way to Fraser Street to dine there with me. So Audrey and I were thinking of meeting up since the first day I stepped on Vancouver’s soil but we were both so busy that we only managed to meet on my second last day there. I suggested Pinpin since I haven’t ate there yet, Audrey is fine with anything and her boyfriend drives. So we went to Pinpin and although Pinpin is just a walk away from my home, I was late for the meet up – what a bad habit, seriously! Anyway, Pinpin hasn’t changed a bit and even the servers were the same! We were seated at my usual corner – the last table at the very end of the restaurant, which is just beside the entrance. 1st picture – Four of us shared the Pancit Palabok, which is one of my favourite noodles at Pinpin! I never fail to order that whenever I am at Pinpin since I love seafood and rice noodles. 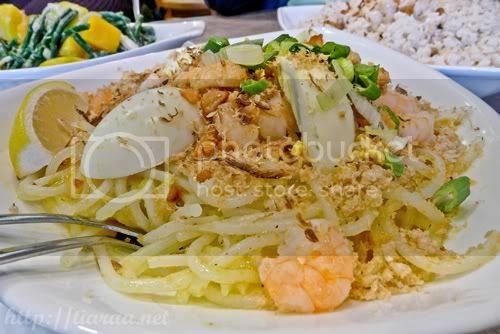 The rice noodles are really chewy and flavourful because of the rich seafood sauce and their shrimps are really fresh. The pork cracklings add crispiness to the dish and the tofu and egg blends very well with the dish. The dish costs CAD$8.95 but I find that their portion has downsized. Previously, there was a larger serving size for Pancit Palabok. 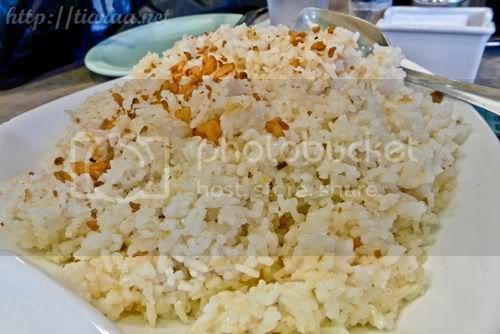 2nd picture – We had the large portion of Garlic Rice for CAD$4.75. This is the first time I tried the Garlic Rice at Pinpin because usually I order noodles. However, I think Garlic Rice is definitely one of the food that you have to consume with the other rich dishes like Sitaw at Kalabasa Sa Gata. 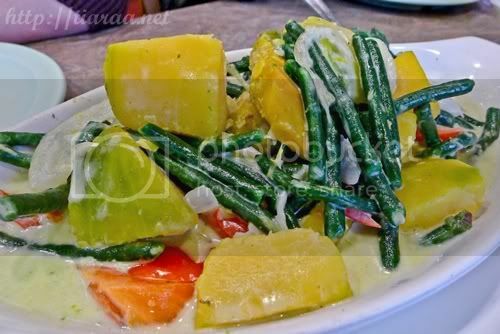 3rd picture – I wanted to try the Sitaw At Kalabasa Sa Gata so badly because I love my veggies with coconut milk! It was definitely worth your CAD$895! The string beans soaked in coconut milk is still as soft but the squash is a little harder than before. They should probably boil it longer. Overall, I enjoyed this dish the most! 4th picture – Since we were in a Filipino Chinese restaurant, we had to order the Crispy Pata! I remember when I was young, I used to eat this as my parents would offer crispy pork knuckles to the Chinese deities. The meat is really tender, moist and crispy – my cup of tea. 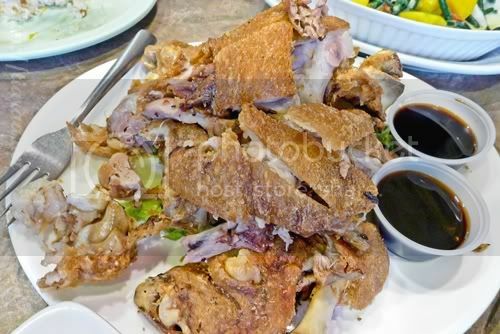 Our small portion of Crispy Pata costs CAD$9.95! 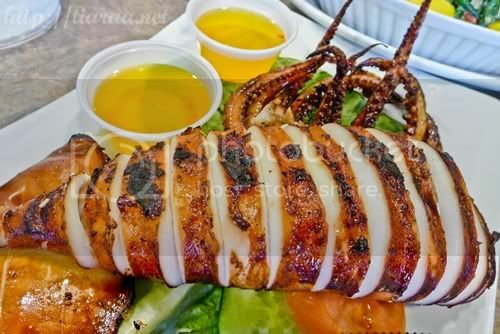 5th picture – Since I hardly consume Filipino food in Singapore, I know that I have to make my time worth in Vancouver consuming Inihaw Na Pusit! As we already ordered quite a handful of dishes for the four of us, we decided to order the smallest portion of Inihaw Na Pusit costing us CAD$9.50. The grilled squid was so gratifying that it was gone within seconds! In conclusion, Pinpin has never failed me!